The Flavor Invigorator PURE BLEND is a hydro-organic compost solution blended with select organic ingredients from the land and sea. PURE BLEND contains all major and secondary elements, as well as an abundance of trace minerals, growth hormones, cytokenins and auxins. PURE BLEND also contains a vast array of vitamins, enzymes, amino acids, natural humates, carbohydrates and organic plant acids. 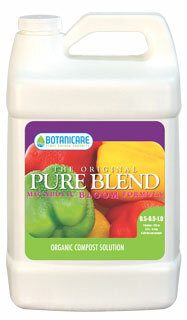 Pure Blend™ - The Original is a hydro-organic compost solution blended with select organic ingredients from the land and sea. Pure Blend contains all major and secondary elements, as well as an abundance of trace minerals, growth hormones, cytokinins and auxins.